Promotion-chasing Fylde had to settle for a point in a game of two own goals at struggling Maidstone. 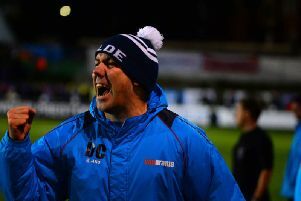 Manager Dave Challinor made five changes to the side which began Tuesday’s amazing 5-5 FA Trophy draw at Ramsbottom United, reverting to the team which started the previous league game at Solihull Moors. Dan Bradley and Ash Hemmings returned after being cup-tied at Ramsbottom, while there would be debuts off the bench for latest signings Alex Reid and Lewis Walters. 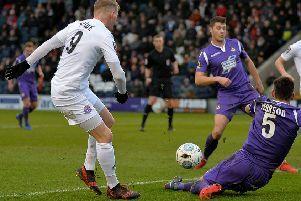 While Fylde were looking to build on back-to-back league wins over promotion rivals Wrexham and Solihull Moors, second-bottom Maidstone's veteran boss John Still was out to halt a run of three successive league defeats, in which they had conceded 10 goals. Given the contrasting league form of the clubs, it was perhaps no surprise that Fylde were dominant in the first half at Gallagher Stadium. Danny Philliskirk fired wide for the Coasters in the first minute, when Nick Haughton's deflected cross fell to him on the edge of the box. The visitors continued to look dangerous and smart movement by Ash Hemmings set up a position for the winger to curl a shot over the top from outside the box. A rally from the Kent club forced Jordan Tunnicliffe into an important headed clearance as Fylde looked confident on the artificial surface, with conditions a million miles from those at Ramsbottom four days earlier. At the opposite end, the ball wouldn't quite fall for the league's top scorer Danny Rowe. A cross by the pacy Timi Odusina just eluded the 21-goal frontman, who was then thwarted by on-loan Crystal Palace keeper Dion-Curtis Henry after collecting Philliskirk's searching pass. Henry was relieved to see Hemmings' low 20-yard effort creep just wide, then the influential Dan Bradley's dipping effort from distance was tipped against the crossbar by the keeper. Bradley was taking charge in midfield and he forced the deserved opener on 28 minutes. From Hemmings' classy through-ball, Bradley crossed and defender Aron Davies got his clearance all wrong, sending the ball into his own net. Fylde’s celebrations were briefly cut short as an offside flag was waved but referee Carl Brook overruled his assistant and the goal stood. The visitors comfortably held their lead until the interval and remained strong after the break. Rowe's shot from Odusina's incisive pass was blocked and the ball rebounded to Philliskirk, whose powerful low volley was palmed away well by Henry. Maidstone, who also drew in the Trophy on Tuesday, tried to respond positively by replacing defender Dan Meredith with striker Jake Robinson but Rowe had a chance to double Fylde's lead. The prolific striker seemed to be taken by surprise as Haughton's cross was deflected straight at him and he shot wide. Fylde were pegged back in the most unfortunate circumstances on the hour, after Hemmings' pass was intercepted to set up a Maidstone attack. A cross-shot by substitute Robinson looked to be passing wide but Philliskirk turned the ball past his own keeper for the second own goal of the afternoon. Fylde responded by introducing Walters in place of Haughton and the new arrival soon made an impact. Hemmings got a shot away from an acute angle and Henry was forced into another top stop to keep out Rowe's 30-yarder. But the Kent club were growing in confidence and would have taken the lead but for the heroics of Fylde keeper Jay Lynch. Ollie Muldoon’s perfectly-delivered free-kick was met by the rising Robinson, whose goalbound header was kept out by Lynch's spectacular diving save. Attacker Reid made his Coasters debut in the closing stages, providing a different outlet. But although his link-up with Rowe showed promise they could not forge another opening. Fylde are still fourth and four points behind leaders Leyton Orient, though the gap between the Coasters and second place has increased from one point to three. They have overtaken Salford City but been passed by Wrexham. Fylde may have earned a point at a ground where they lost last year but Challinor could not hide his disappointment. The manager said: "We’re disappointed in that we’ve played an awful lot worse than that this season and won. “I think it highlights how fine the margins are between winning and losing, and where you can get in the table. Fylde attempt to seal an FA Trophy quarter-final spot at the second attempt on Tuesday, when Ramsbottom visit Mill Farm. Fylde: Lynch, Odusina, Francis-Angol, Byrne, Tunnicliffe, Croasdale, Bradley, Philliskirk, Hemmings (Reid 83’), Haughton (Walters 65’), Rowe; subs not used: Bond, Crawford, Tasdemir.